Following a funeral it is our practice to mark a grave with a temporary cross and to provide a loan vase for flowers; however, most families will ultimately require a permanent memorial. 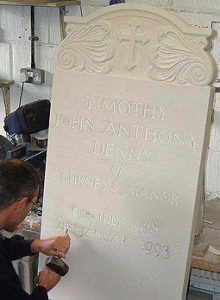 We work closely with a long established local stonemason, who also offer the same high level of service as we do. Headstones of every variety can be provided, either working from designs they have, or incorporating your own ideas. Please ask us for a fully illustrated brochure. Please note that we are available to offer memorials to all families, even if we did not carry out the funeral.